Waves Lease Loyalty Token (WLLT) is a token that represents lessors loyalty to the node: a lessor will earn more WLLT tokens the longer leases its WAVES to the node and the more WAVES he leases. WLLT are stored on a cold wallet, address: 3PCQiEJsERrUyrVV2551MNs4eSDAhgQg5e4. Node address 3PGfXB5bEz7EkbtGMNUYop5aior5X6bUbvL will contains a minimum quantity of WLLT, needed tor distribution. Click here for WLLT Richlist. 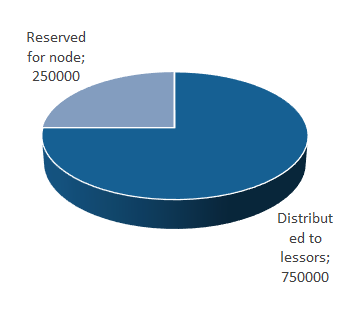 (*) Distribution quantity may be changed accordingly to number of mined blocks trend. 2) WLLT may gives access to initiatives organised by WAVES LEASE Node. (**) Node may decide in future to switch to a complete buyback policy.